According to our survey in February on mobile usage and media consumption, there is an increasing dependency on technology and a mobile first approach by youth consumers in Africa. This trend is being driven by African millennials with Africa having the highest youth population in the world. 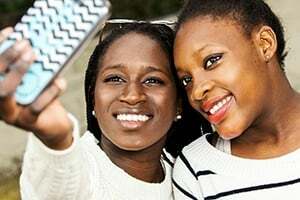 African millennials are increasingly using social media sites as tools for communication and as their first source for news and information. 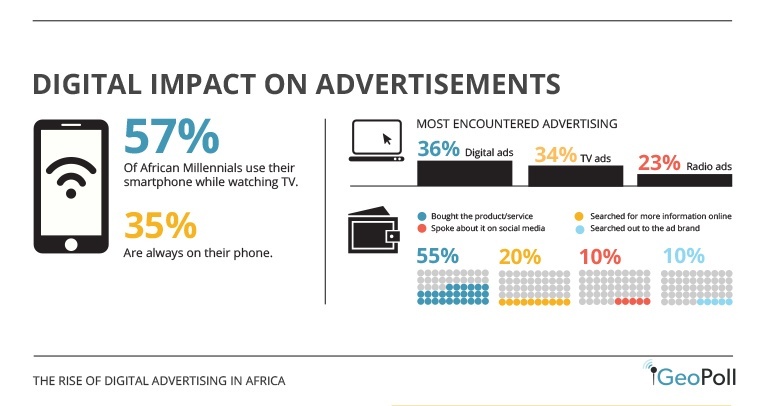 Although extensive research on media and consumer trends in Africa shows a growing transition of consumers and audiences away from traditional media towards online media, television remains a highly significant contributor to consumer spending. In a white paper presented at last year’s PAMRO conference for Media & Media Researchers in Africa, Waithera Kabiru the Digital Marketing Manager, Coca Cola Southern and East Africa posed the following questions to marketers; why is media investment not in line with the activity that is going on online? If African consumers are spending much more time online versus print or even TV, why is there still an under-investment in online channels? In June 2017, GeoPoll sought to better understand how youth consumers are interacting with the advertising they encounter from the multiple sources of media consumed daily. 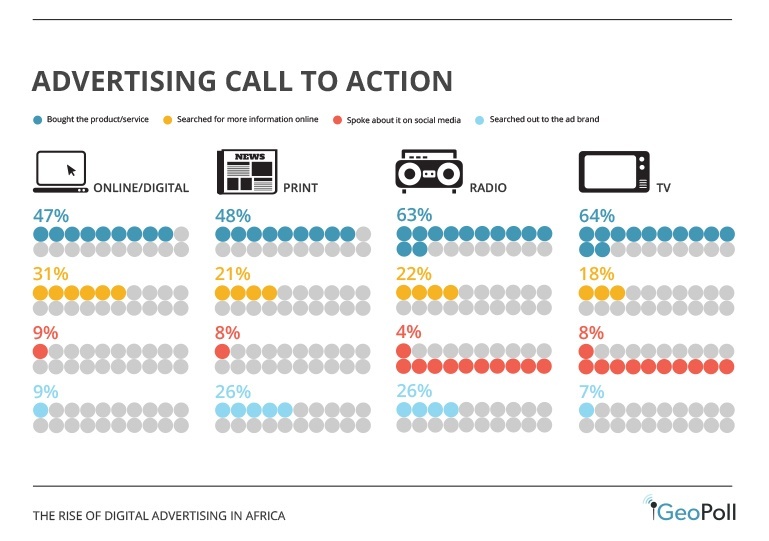 We interviewed 3,710 youth aged between 15-35 years old in Kenya, Uganda, Tanzania, Ghana, Nigeria and South Africa with the aim of determining the specific media platforms they consumed the ads from and how online advertising is fairing against above the line advertising media namely TV, radio and print, in terms of reach and effectiveness.The insights from this survey, though not representative of the total population in these countries, provides valuable insight into the consumption of advertising by youth and the rise of digital advertising’s reach. According to the survey, the top three most consumed forms of media on a daily basis are the internet (46%), TV (25%) and radio (24%) with the internet having the highest daily usage rating of 7.09 points. Today’s youth has become more outspoken about their buying experiences and interactions with brands before, during and after purchasing goods and services. The age of the second screen phenomenon in which these young consumers are more likely to be on their smartphone as they watch TV, encounter outdoor media or even as they listen to the radio. This is due to the increased growth in smartphone in usage as compared to other media forms. Digital ads are the most encountered advertising media consumed mostly through smartphones. According to the poll, those who encountered advertisements reacted by either buying the product, going online to seek more information or going on social media to share their thoughts and opinion on the ads. Unlike the pre-internet era, youth no longer have to wait until the next time they are out shopping to get more information about a new product or service. The information seeking phase of the consumer buying process is shorter thanks to the internet. This new channel has enabled consumers to easily search for, inquire about or discuss the product or service from whichever device is closest to them when encountering an advertisement. Information search is crucial to consumers who encounter ads from various sources. 22% of respondents indicated that they went online to read up on the product/service they saw in an ad. Social media is increasingly becoming a popular platform for consumers to discuss and engage with brands. In fact, 8% of respondents also indicated that they had used their social channels to speak about an ad with 15% reaching out and engaging the brands in the ads directly on their online channels. As the internet continues to enjoy increased usage among the surveyed age group, there is a need for businesses to seek deeper insights on their marketing strategy around this demographic. Actions such as online information gathering on brands and social media interactions about and to brands continue to see a surge in growth as consumers who encounter brand advertisements seek to be better informed. Stay up to date with the last from GeoPoll to our newsletter today. *This GeoPoll rapid survey was conducted in June among 3,710 youth in Ghana, Kenya, Nigeria, South Africa, Uganda and Tanzania using the GeoPoll Mobile application.